(Boston, MA & Windsor, VT) – Searching for something more social than water after your flag football game? Feeling like you’ve earned something special after that 10K? Harpoon Brewery knows the feeling. That’s why the craft brewery is rolling out Harpoon Rec. League, a unique hoppy, hazy pale ale meant to celebrate life’s small victories – and huge celebrations. Brewed with unique ingredients like buckwheat kasha, which provides important minerals and B vitamins; chia seeds that are high in fiber, Omega-3 fatty acids and antioxidants; and Mediterranean sea salt that offers a powerful source of electrolytes — Rec. League gives beer lovers multiple reasons to feel good about each sip. For all the times you want flavor and need drinkability, Rec. League is a game-changer. Coming in at 3.8% ABV and only 120 calories per 12 oz serving, this gold-medal winning addition to our year-round lineup is perfect for before, during, after, or while contemplating your next workout. “Fans of Harpoon do more than drink beer – they’re running road races, working out with friends, and hitting the slopes. We wanted to make a beer that celebrates and complements this active lifestyle,” says Tom Graham, Innovation Brewer at Harpoon Brewery and mastermind behind the beer. Rec. 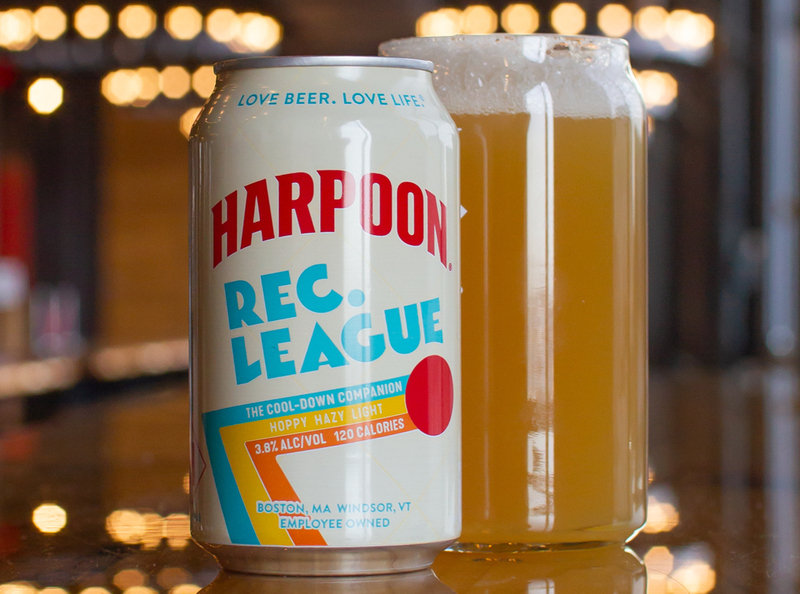 League is Harpoon Brewery’s most refreshing pale ale yet. A light and crispy yet characteristically hoppy beer, this hazy pale ale is thirst-quenching and refreshing, making Rec. League the newest lower-calorie option that doesn’t sacrifice flavor. Rec. League is now available throughout the U.S. in 4-pack 16 oz. cans and 15-pack 12 oz. cans. Beer drinkers can also try the beer at Harpoon’s brewery locations in Boston, Mass. and Windsor, Vt.
To learn more, visit www.harpoonbrewery.com. The Harpoon Brewery was founded in 1986 by beer lovers who wanted more and better beer options. When the Brewery was founded, Harpoon was issued Brewing Permit #001 by the Commonwealth of Massachusetts, since it was the first to brew commercially in Boston after a dormant period of about 25 years. Harpoon’s line of craft beer features its award winning IPA and seasonal beers, along with special limited releases. In 2014, Harpoon became employee owned.